Fugro will acquire the sea? oor data using a deepwater auton- will be for the bene? t of industry and our understanding of the omous underwater vehicle (AUV) equipped with sonar-based world’s oceans.” survey systems. This information will be used to ground-truth In addition to increasing the speeds and methods by which the work of 21 semi? nalist teams advancing to Round 1 of the baseline bathymetry could be acquired, the competition offers competition. The challenge for the competing teams is to de- a special $1million incentive sponsored by the U.S. National ploy their inventions to operate at 2,000 meters ocean depth, Oceanic and Atmospheric Administration (NOAA) for sys- mapping 20% of the project site at 5 meters resolution, and tems that can also detect and track biological and chemical identifying at least ? ve archaeological, biological or geologi- signals. Such advancements would improve emergency re- cal features, all within a 16-hour timeframe. sponse and foster the discovery and monitoring of new marine “The semi? nalist teams in the Shell Ocean Discovery life and underwater communities. XPRIZE are pushing the envelope of deep sea mapping ca- First round testing for semi? nalist teams is scheduled to pabilities, and we are delighted to partner with Fugro on this commence in September 2017. 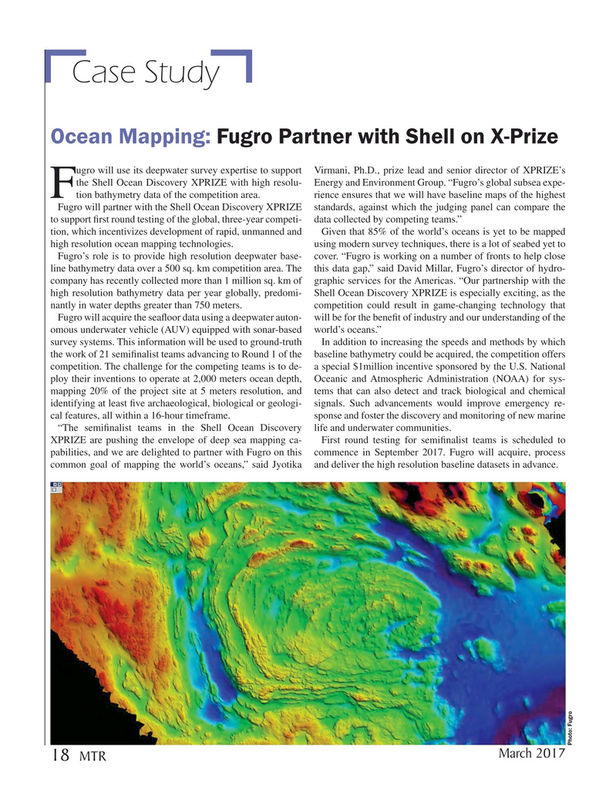 Fugro will acquire, process common goal of mapping the world’s oceans,” said Jyotika and deliver the high resolution baseline datasets in advance.